In a day where most hold such little regard for God's Word; where even many of God's own have yet to learn of its worth, today's post is a wonderful reminder of its intrinsic value. Oh the immeasurable height, depth, and the breadth of God's word. It has cost many wonderful Saints their precious lives in order that future generations have God's Word in their hands, to read with their own eyes and to understand it....let us also contemplate the cost of our Lord Jesus Christ, that we might have His Father's Word living in our hearts. "Let it not make thee despair, neither yet discourage thee, O reader, that it is forbidden thee in pain of life and goods, or that it is made breaking of the king's peace, or treason unto his highness, to read the Word of thy soul's health—for if God be on our side, what matter maketh it who be against us, be they bishops, cardinals, popes." William Tyndale could speak seven languages and was proficient in ancient Hebrew and Greek. He was a man whose intellectual gifts and disciplined life could have taken him a long way in the church—had he not had one compulsion: to teach English men and women the good news of justification by faith. Tyndale was tried for heresy and in early August 1536, Tyndale was condemned as a heretic, and delivered to the secular authorities for punishment. He was brought to the cross in the middle of the town square and given a chance to recant. That refused, he was given a moment to pray. English historian John Foxe said he cried out, "Lord, open the King of England's eyes!" Then he was bound to the beam, and both an iron chain and a rope were put around his neck. Gunpowder was added to the brush and logs. 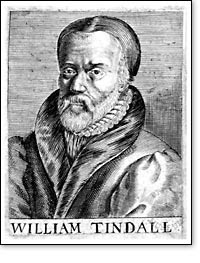 At the signal of a local official, the executioner, standing behind Tyndale, quickly tightened the noose, strangling him. Then an official took up a lighted torch and handed it to the executioner, who set the wood ablaze. How do we respond to so great a sacrifice? Today we are witnesses of so many so many who twist and pervert God's word, and of those fellow believers who are neglectful and forgetful of it's worth. Let us this day esteem that which our Lord has esteemed above His own precious name....His invaluable Word! The following is gleaned from a bible study inspired by Thomas Manton on Psalm 119, and taught by Tim Pauley. Our writer proclaims the Word of God to be of greater value than “thousands of gold and silver pieces” and worth more than “fine gold”. Picture the treasure hunter who finally discovers the chest full of gold and greedily plunges his hands into the pile of coins and lets them fall through his fingers. Instead we envision going to the pages of Scripture and reveling in truth we find there. The contrast of the surpassing value of spiritual things over that of earthly riches is found throughout Scripture. Proverbs 2:4 encourages us to seek for wisdom “as silver, and search for her as for hidden treasures”. Proverbs 3:14-15 proclaims, “For the merchandise of it is better than the merchandise of silver, and the gain thereof than fine gold. She is more precious than rubies: and all the things thou canst desire are not to be compared unto her.” Jesus had a great deal to say about the inferior value of earthly wealth: “Lay not up for yourselves treasures upon earth, where moth and rust doth corrupt, and where thieves break through and steal: But lay up for yourselves treasures in heaven, where neither moth nor rust doth corrupt, and where thieves do not break through nor steal: For where your treasure is, there will your heart be also.” (Matthew 6:19-21). Jesus warned of greed with a powerful illustration and cautioned us “Take heed, and beware of covetousness: for a man's life consisteth not in the abundance of the things which he possesseth.” (Luke 12:15). Paul writes about “the exceeding riches of his grace in his kindness toward us through Christ Jesus.” (Eph. 2:7) and of the “unsearchable (unfathomable) riches of Christ” (Eph. 3:8). It is with this in mind that our writer exclaims “The law of your mouth is better to me than thousands of gold and silver pieces”. This is his appraisal of the value of God’s Word. An appraisal is an estimate or considered opinion of the nature, quality, importance, and worth of an item. In this verse we see the writer’s appraisal of the nature, quality, importance and worth of God’s Word, both in its intrinsic value, and the value he ascribed to it. Why is the Scripture of such great value? What makes it worth more than piles of earthly riches? Let us think for a few moments of what makes an item valuable. When we do so, we quickly realize why we should highly esteem and value God’s Word in our lives. The Source of the Item. What makes a work of art valuable? It is the artist who created it. Paintings by Rembrandt or Van Gough are extremely valuable because of the masters who painted them. Both verses make clear that it is God who has spoken to us in the Scriptures. “The law of Your mouth” and “Your commandments” both tell us God is the source of the truth we hold in our hands. That alone is enough to make the Bible supremely valuable. Paul was thankful the Thessalonian believers valued God’s Word “not as the word of men, but as it is in truth, the word of God, which effectually worketh also in you that believe.” (1 Thes. 2:13). If we truly believe that the Bible is indeed the Word of God, then we will value it supremely. The Necessity and Usefulness of the Item. The more useful and important to our lives something is, the more valuable it becomes to us. We saw this demonstrated in the demand for electric generators during the recent extended power outages. As a matter of fact, without regulation, prices would skyrocket on items at such times. To value God’s Word we must come to recognize our great spiritual need. We understand that we have all sinned before a holy God and face His wrath and judgment. In the Scripture we find the truth to meet that need, since “faith cometh by hearing, and hearing by the word of God.” (Romans 10:17). It is in the Word we learn of Christ’s suffering and death on our behalf, so that in repentance and faith we can have His righteousness given to us. Peter reminds of this when he says, “ye were not redeemed with corruptible things, as silver and gold, from your vain conversation received by tradition from your fathers; But with the precious blood of Christ, as of a lamb without blemish and without spot" (1 Peter 1:18-19). When we understand that our great need can only be met through the truth we find in God’s Word, then we will esteem the riches of God’s Word above any we can gain in this world. The Lasting Quality of the Item. “They don’t make ‘em like they used to” is a phrase we often use to bemoan the poor quality of many things made today. We value that which is well made so that it will last. The Psalmist recognized God’s Word as that which will truly last. “For ever, O Lord, thy word is settled in heaven.” (89). “The righteousness of thy testimonies is everlasting: give me understanding, and I shall live.” (144). “Concerning thy testimonies, I have known of old that thou hast founded them for ever.” (152). We remember Jesus’ warning that earthly riches may be destroyed or stolen, but the treasures we lay up in heaven are eternal. (Matthew 6). Paul reminds us to “look not at the things which are seen, but at the things which are not seen: for the things which are seen are temporal; but the things which are not seen are eternal.” (2 Cor. 4:18). We are warned about putting our money into things that depreciate. We are counseled to invest in things that appreciate in value. What we must remember is EVERYTHING DEPRECIATES except those eternal treasure of which we are taught in the Word of God. The Psalmist wrote “The law of your mouth is better to me than thousands of Gold and silver”. This reveals the value he ascribed to it. This was his own appraised value. He demonstrated this appraisal throughout the rest of Psalm 119 as he committed to read it, study it, pray over it, and seek to walk consistently in its ways. His life was governed by what he valued and esteemed. This appraisal of God’s Word as more valuable than earthly riches has three powerful implications for us. If we have earthly wealth, it should draw our hearts from it to better things. If we want earthly wealth, it should encourage us to find contentment in godliness and those things that really matter. And, if we lose earthly wealth, we know when we have Christ we still have that which is better and really matters. In times past men have been put to death for translating the Bible into the common language of the people so they could read it and study it for themselves. Many have died seeking to proclaim the Word as missionaries to foreign countries. Even today in some parts of the world people may be arrested, imprisoned, beaten, and even put to death for possessing and distributing the Christian Scriptures. They have obviously placed great value on the Word of God. Do we value God’s Word above earthly riches? WHAT IS YOUR APPRAISAL OF GOD’S WORD?